I have a copy of this painting here in my study as a daily reminder of my chattering monkey mind. This version is a fusuma (sliding door) painting by Hasegawa Tohaku that he painted during the 16th Century (Muromachi Period) in Japan. It can be seen today at the Konchi-in Temple in Kyoto. 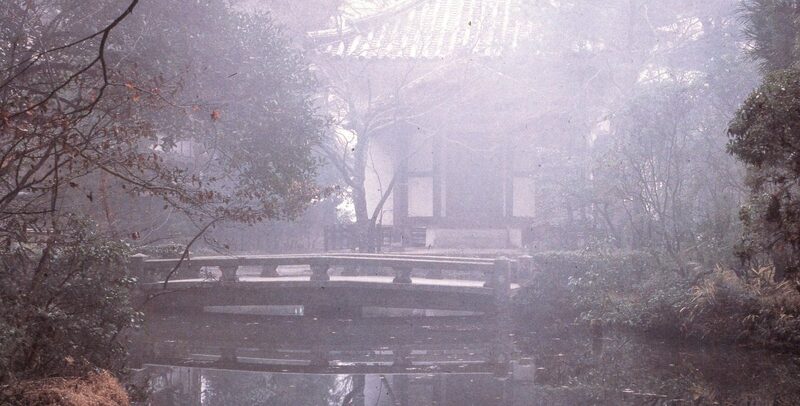 This is a sub-temple of the famous Zen Temple of Nanzen-ji. While most people pass by this smaller temple to see the main attraction, they miss a beautiful example of a dry landscape garden (karesansui), lovely borrowed landscape (shakkei), and this wonderfully whimsical picture of the grasping soul of humanity. 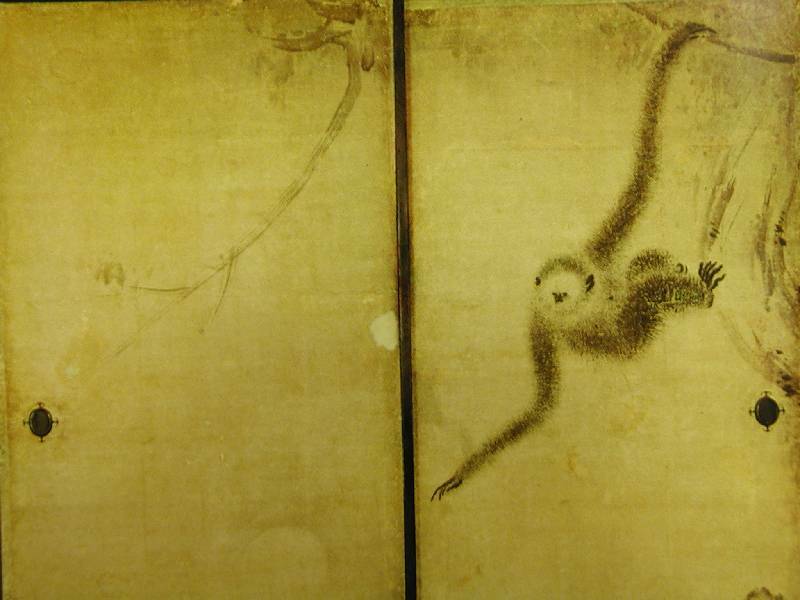 You might have to look very closely at the bottom left/center of the painting to see the pale moon for which the monkey is reaching. I hesitate to add my two cent’s worth to Hakuin, Dogen, and Nagarjuna, but this image holds a couple of captivating meanings for me. My first impression is that the moon symbolizes all the elusive and illusive things I think I need in this ephemeral world. If, however, the monkey did manage to grab hold of the moon, he would be disappointed, since it would instantly disappear in the water disturbed by his grasping hand. So, too, the attractiveness of things seems to evaporate once we have them. We wait and wait for Christmas morning (or its adult equivalent), but there is usually a terrific let-down in the afternoon. We are on to the next better thing: a better job, a better place to live, a better wife or husband. The monkey will never be satisfied as long as it continues to reach for illusory substitutes for the real thing. Or St. Augustine: inquietum est cor nostrum donec requisecat in te–our hearts are restless until they find repose in the Divine (or in the Tao, or in the Heart of Life). Until then, I am a monkey reaching for an empty image of the moon. I find the second level of meaning more subtle–but also more exciting. The three Buddhist teachers quoted above all suggest that not only should we cease to reach for illusory things, we should stop reaching for anything at all–even for enlightenment! The moon symbolizes Enlightenment itself, but that straining to reach enlightenment is itself “having a great grasp on grasping.” The desire to be enlightened puts the whole thing on hold, waiting for a thunderbolt in the future to crack open the shell of ego. Hakuin, however, urges us to give up the striving, and simply to sink into the still, clear pool of NOW. This is not only where Enlightenment is, it IS enlightenment. Dogen, too, says that the moon of enlightenment is here in this dewdrop on the blade of grass. If we can see that, we see all there is to see with dazzling purity. Contemporary writers such as Eckhart Tolle and Byron Katie are fervent in their invitation to love what is here and now, as they echo the ancient voices of Epictetus. Marcus Aurelius, and Heraclitus. The Third Chinese Zen Patriarch, Seng-Ts’an, begins his Hsin Hsin Ming (Heart/Mind Sutra) with the words “The Great Way (Tao) is easy for one who has no preferences,” i.e. no desires for a better me, a better life, a better tomorrow. As Hakuin says, the monkey in me will keep hanging from that branch for all the days of my life, always reaching, never giving up, and never getting anywhere. Maybe it’s time to let go. If not now, when? This entry was posted in Grasping Monkey, Philosophy and tagged Dogen, Grasping monkey, Hakuin, Hasegawa, Nagarjuna, Power of Now, Tao on August 14, 2014 by jhanagan2014.